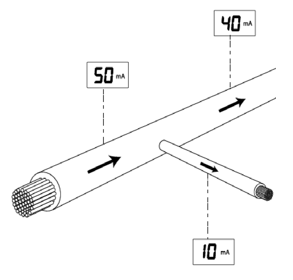 Measuring current value on a line helps confirm the identity of the line and may provide information about the condition of cable insulation or pipe coating. The transmitter applies a signal or current onto a target line. The current decreases in strength as the distance from the transmitter increases. This rate of decrease depends on the type of line and on soil conditions. Regardless of the type of line and the frequency being used the rate of decrease should be regular with no sudden drops or changes. Any sudden or abrupt current change indicates that the line or its condition has changed. 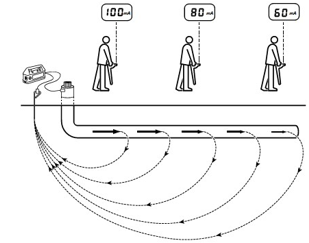 In congested areas, where there is more than one line, the locator may sometimes detect a stronger signal from an adjacent line to which the signal has coupled or shares common grounding because it is nearer the surface. Although current measurement compensates for depth, signal response will be less as the depth increases. The line with the highest current measurement, rather than the line giving the strongest response, is the target line to which the transmitter signal has been connected. Measuring current provides useful information about the position of bends and intersections. Measuring current after a tee will indicate the main line that pulls more current along its greater length. The transmitter signal can be connected, clamped or induced to the target line in the same way as the signal for line tracing is applied. WARNING! Direct Connection to live conductors is POTENTIALLY LETHAL. Direct Connections to live conductors should be attempted by fully qualified personnel only using the relevant products that allow connections to energized lines. Pinpoint the line and confirm the accuracy of the Peak pinpoint with null arrows. Check the locator is directly over the line, with the antennas at right angles to it and vertical. The locator will automatically estimate and display depth on the LCD. A signal coupled to a nearby line may distort the accuracy of the measurement. If the accuracy of the reading is suspect, sweep the area to check if other nearby lines are radiating the signal. If other signals are causing interference, it may be necessary to make the current measurement at another point along the line. Both antennas are needed to make a current measurement and locator accessory antennas such as a normal clamp or stethoscope cannot be used. Because current measurement is a function of depth, it is only available in active locating modes. It is also available with Current Direction (CD) clamps.